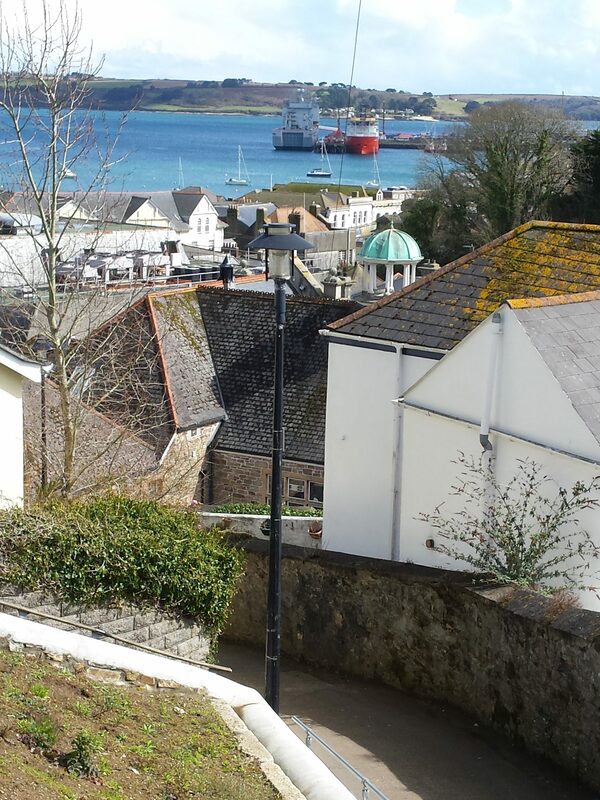 Growing up in West Cornwall, I almost never went to Falmouth; my sister had friends who played in bands in sticky-floored pubs near the docks, but it wasn’t really for me. 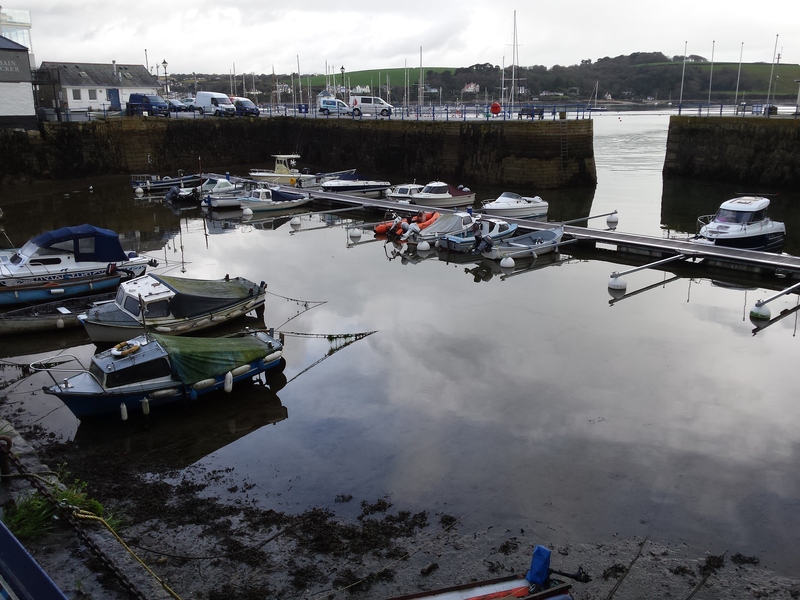 We’d go to Truro for shopping when our nearest town, Helston, fell short; we sometimes went to Penzance but I really didn’t know Falmouth, which required an awkward journey through the lanes around the Helford river. 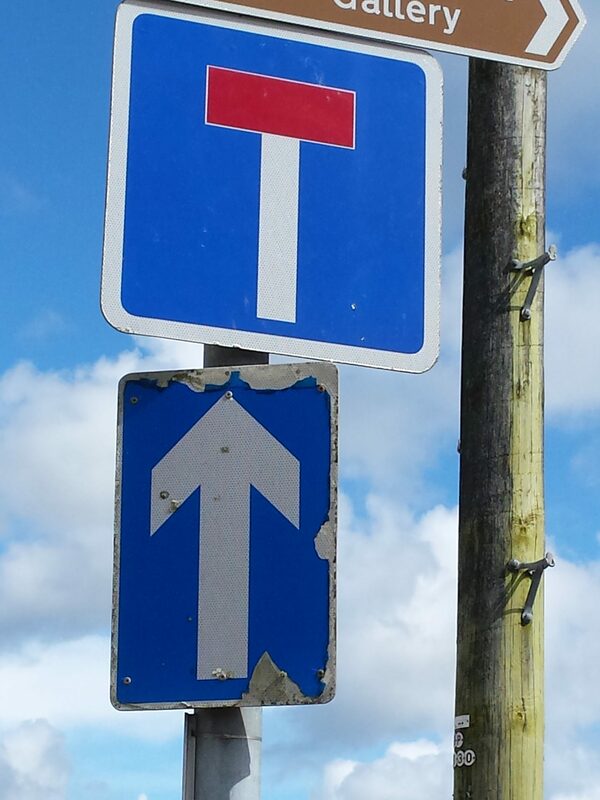 In those days it seemed thoroughly post-industrial (though admittedly never as run-down as Redruth and Camborne), but it has gentrified and the Sunday Times’ readers recently voted it their favourite town. It’s been hugely boosted by the transformation of the Art College (small but always prestigious enough) into a university (two in fact, as the University of Exeter shares its Tremough campus), so there are cool cafés and plenty of arty students (as boho as any in Dalston) to hang out in them, and the town even has a proper independent bookshop, something which much grander Truro can no longer support. The opening of the National Maritime Museum Cornwall in 2003 put Falmouth on all the tourist maps, but the real marker of gentrification was the opening of a seafood restaurant by Rick Stein in 2010. When I was there a few weeks ago the Spring Festival was under way, with Science in the Pub events exactly like those I’d left behind in Cambridge! There was no town here in medieval times, as the site was too exposed to attack from the sea until Henry VIII built Pendennis and St Mawes castles; it really only came into being after 1688 when the Post Office chose Falmouth as the port for its Packet Service to Spain and Portugal, and later across the empire. In 1805 news arrived here of Nelson’s victory, and death, at Trafalgar, from where it was carried to London (271 miles away) in just 37 hours, with 21 changes of horse (at a cost of £46 19s 1d), and in 1836 the Beagle, with Charles Darwin aboard, arrived here at the end of her voyage of circumnavigation. 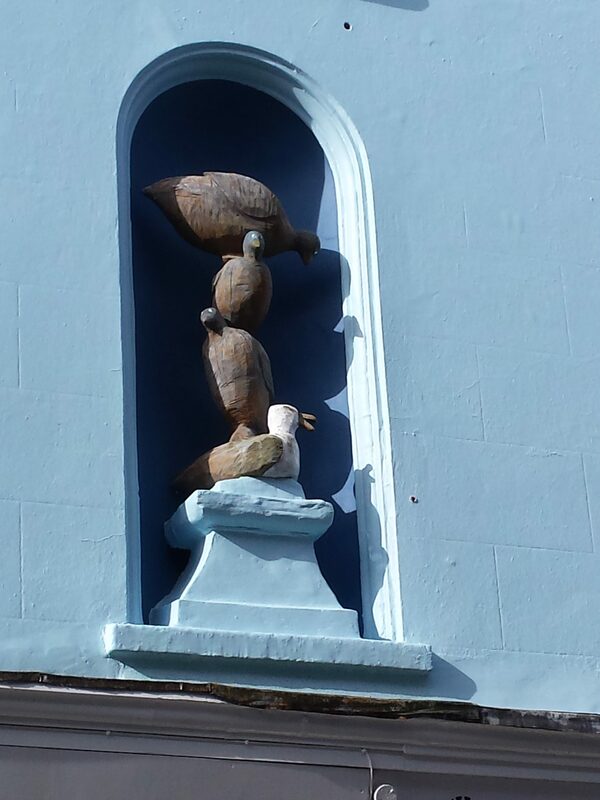 These are mentioned on various plaques, and in The Levelling Sea, a superb account of Falmouth’s history by Philip Marsden, who lives just a few miles away across the harbour. 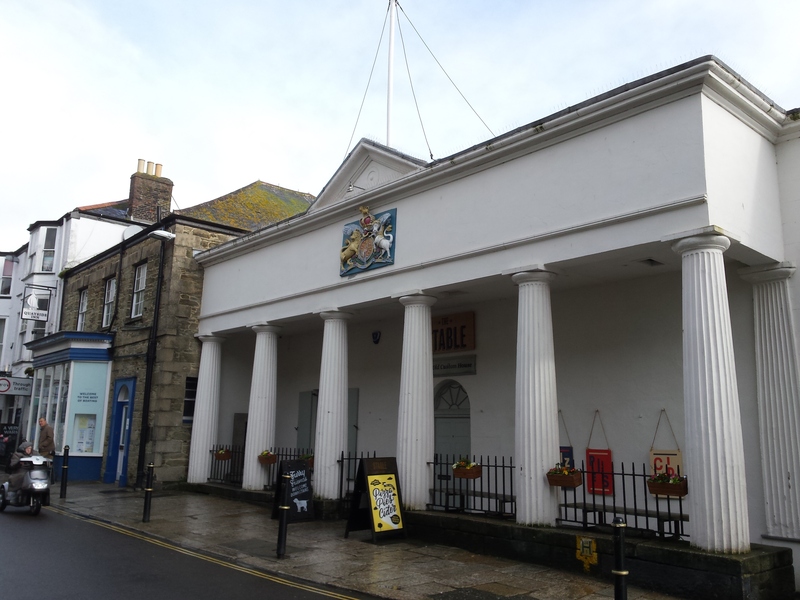 A couple of weeks after my last visit to Falmouth I was, by chance, in Nelson’s home village, which I will mention in another post. The port declined in the late twentieth century, but the docks seem livelier these days, repairing ships including the Navy’s Royal Fleet Auxiliaries, and cruise ships now come in to the world’s third largest natural harbour. Admittedly most of them just get on buses to the Eden Project and the Lost Gardens of Heligan, but one side effect may be that there’s still a good supply of public toilets, unlike the rest of Cornwall where the gruesomely penny-pinching county council is trying to close them or even to find private concerns willing to try to somehow keep them open. The town centre loosely falls into two parts, the waterfront street from the Maritime Museum past the church, and The Moor, a square on the hillside just above. There are some great cafés and restaurants in the lower area, but the more hipster artisan coffee bars (and barbers) seem to be on The Moor and just above. I always pop in to Falmouth Art Gallery, at the bottom end of The Moor, because it’s free and has both interesting temporary shows and a permanent collection featuring leading Cornish artists (as well as John Singer Sargent and Tilly Kettle), but also because of their weird and wonderful automata. The most popular is the AutoWed, which you really can use for your wedding – it’s a product of Sam Lanyon’s Concept Shed, just a few hundred metres from the museum. Falmouth still has plenty of pubs, and a remarkable number of them seem to be free houses, offering a wider choice of beers than those tied to one brewery. On the other hand, they tend not to bother much about food. 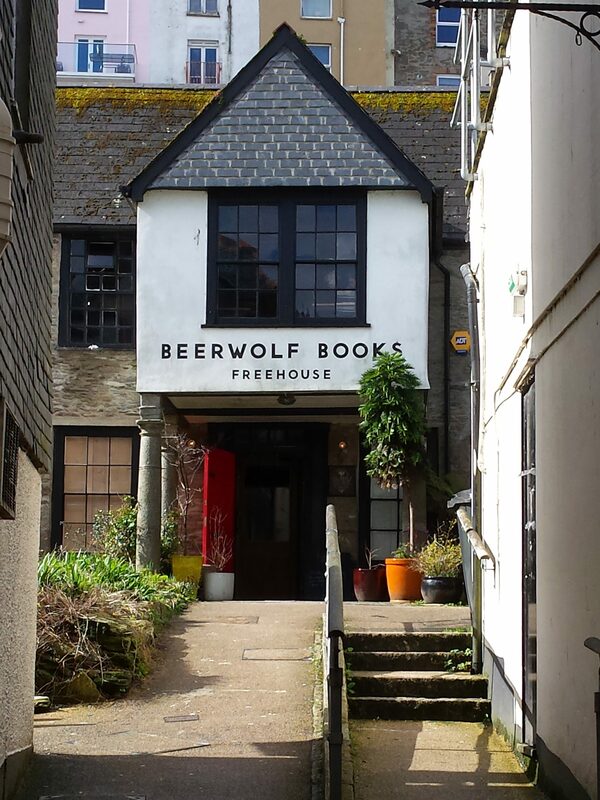 For me, the best discovery recently in Falmouth has been Beerwolf Books, a pretty unique bookshop-pub in a eighteenth-century sea-captain’s house (I think). Surprisingly, it was once home to the Falmouth Working Men’s Club; it’s totally un-wheelchair accessible, alas. I wasn’t sure what to expect, but on balance you can ignore the bookshop room but you can’t ignore the bar, so it’s essentially a pub, and a very good one too. I was particularly pleased to find organic, vegetarian beer from my favourite Manchester brewery, Marble. They don’t do food, but next door in the same courtyard is the Courtyard Deli & Kitchen, using the finest local produce. Other good pubs include the Boathouse, with stunning views across to Flushing and great beer, the Seven Stars on The Moor, with a lovely historic interior, and the ‘Front and the Working Boat, both by the harbour. I also hear good things of the HAND Bar; more a bar and bottle shop than a pub, it carries craft beers in bottles and kegs, including from Falmouth’s own Verdant Brewing. As for food, in addition to Stein’s and the Courtyard, a few other tempting options are Pea Souk, a veggie café tucked away up an alley near Beerwolf (they serve takeaway drinks only if you bring your own cup), Stones Bakery, Fuel, Provedore (which is good for breakfast and lunch, and superb for evening tapas – no bookings, so get there early) and Cribbs, a genuine Caribbean restaurant whose owner came from St Vincent as chef on a cruise liner (he’s also just opened Bahama Mamas, a new café-bar on The Moor). And of course a few words on public transport – the university campus now seems to attract buses from all over west Cornwall, and the Truro-Falmouth railway now has two trains an hour each way, while the main Plymouth-Truro-Penzance line just has one an hour – although this is soon to be increased to two an hour after signalling improvements.